Collision repairers will see the steel on Mazdas built on the new SKYACTIV vehicle platform, which Mazda said will spread from the next-generation 2019 Mazda3 to other models. 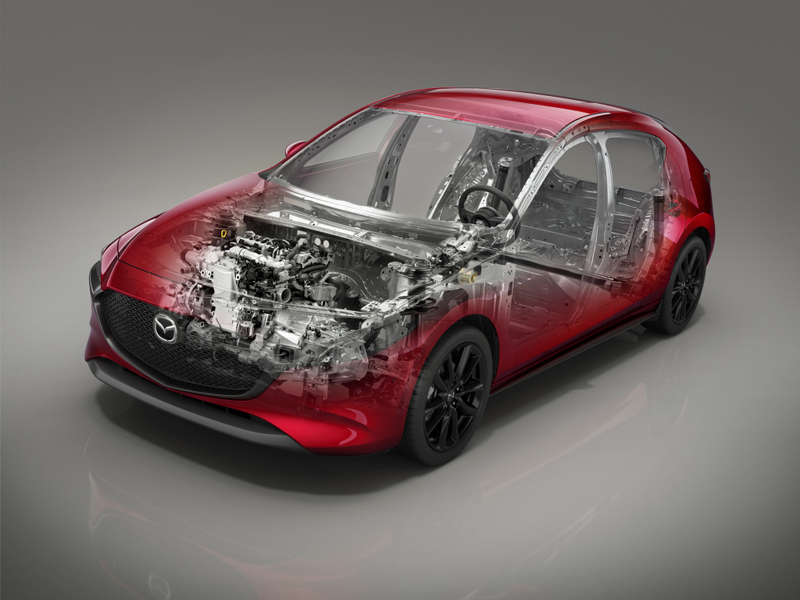 The 1,310-megapascal steel will join what Mazda reports is 30 percent of the Mazda3 body built from ultra-high-strength steel 980 MPa or higher. The 2018 Mazda3s you’re probably seeing in your shop now had a mere 3 percent of steel at or above the 980 MPa mark. Nippon Steel & Sumitomo Metal Corporation and JFE Steel Corporation helped Mazda break this barrier with the 1,310 MPa steel, and it’ll be interesting to see if the metal spreads to competitors also supplied by the steel manufacturers. 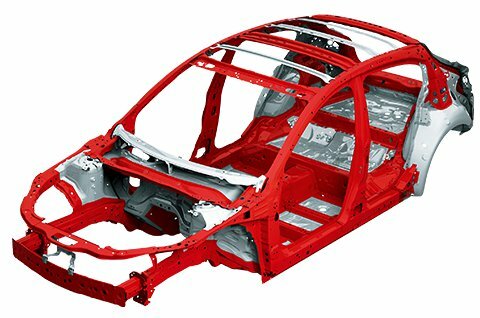 The 1,310 MPa steel will appear on the 2019 Mazda3 on what Mazda describes as the “front pillar inner, the roof rail inner, the hinge pillar reinforcement, the roof rail reinforcement, the No. 2 crossmember and the side sill inner reinforcement.” The metal will allow the OEM to save 6.6 pounds of weight. Mazda sold 64,638 Mazda3s in 2018, so you’re likely to see a 2019 model with the new steel appear in your shop. Even if your area is light on Mazda3s, Mazda’s plans to spread the SKYACTIV platform to other models make it likely you’ll encounter the new metal and archtiecture at some point. The SKYACTIV platform itself make some dramatic structural changes that shops must understand to preserve the intended safety and driving experience of next-generation Mazdas built upon it. “The idea is that protection starts with the strong SKYACTIV body structure, and extends to features such as impact-absorbing materials throughout the cabin, pre-tensioning seat belts and special structures like our impact-absorbing steering column and anti-intrusion brake pedal,” Mazda has written about its safety plans. 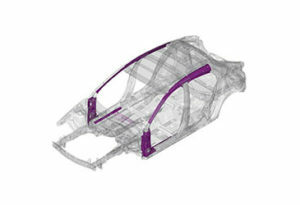 A Mazda corporate site reports the platform will be 8 percent lighter but 30 percent more rigid. 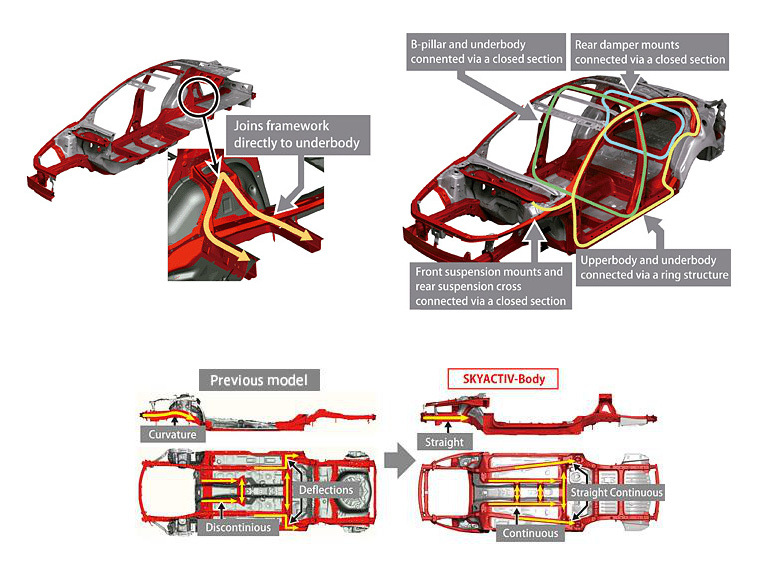 A graphic discussing a Mazda6-type car describes what Mazda calls “high-tensile steel” of at least 340 MPa growing from 40 percent to 60 percent of the body. 590 MPa or stronger advanced-high-strength steel grows from more than 20 percent of the body to 40 percent, and ultra-high-strength steel 780 MPa or higher spreads from nearly 10 percent of the body to nearly 20 percent. Mazda explained that it sought coordination and straightness in designing the platform. For the underbody area, curves were removed as much as possible to create a straight frame in a continuous configuration from the front to the rear. For sections of the frame that still require some curvature, we implemented continuous bonding with the horizontal frame to make the structure a closed section, thus contributing significantly to weight reduction while at the same time achieving rigidity. The upperbody also functions as a constituent part of the continuously bonded framework. Specifically, the suspension mounting positions at the front and rear of the upperbody are directly bonded with the underbody framework as a “dual brace”. In addition, by creating four ring structures for the upperbody that includes the roof rail and B-pillar, and the entire reinforcement area of the underbody, the overall rigidity of the body has been further enhanced. Shops must understand how crash energy moves through the vehicle and restore this performance. This will likely make pre-repair measuring and inspecting the structure even more crucial than it is now to fully capture all the damage; it’s possible that energy traveled somewhere you might not have expected. Mazda wrote that it used a “multi-load path structure” to handle crash energy. And get this — even the door hinges can play a role in safety on Mazdas with SKYACTIV. “To create this kind of path, parts such as door hinges, which do not normally play a role in absorbing shock, are important elements in the design,” Mazda wrote. Mazda also uses a cross shape on the frame instead of a square. Its explanation is fascinating and probably provides yet another reason why you are likely to have to replace frame rails instead of repairing or sectioning them. “The multi-load path approach was also adopted for individual parts,” Mazda wrote. “We focused on directing the crash energy mainly along the ridge lines of the parts, molding the front tip of the front frame into a cross shape. In a conventional square section, there are four ridge lines, but when a cross is created there are twelve ridge lines, and the shock is dispersed more widely. By doing so, the energy is then absorbed more efficiently, the space in the engine room is more effectively used, and there is also greater freedom in exterior design. 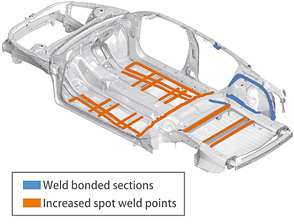 Finally, Mazda mentions that it increased its number of spot welds and used weld bonding on the roof rail.